Whats this carbon tax all about? Evidence who is behind the climate LIE in Australia ? CSIRO Chief Executive Dr Megan Clark was the former Director of Rothschild Bank Australia. Rothschild Australia and E3 International to take the lead in the global carbon trading market . NOW where do we get the notion professor Bob Carter and a plethora of other peer reviewed scientists are not creditable or don’t even exist for that matter. Could it be mainstream media misguiding the public or does it INDEED come from the CSIRO or BOTH ? Now of course we all know who ( Dr Megan Clark ) runs the CSIRO & who ( Rothschild Banking ) they represent. What does Bob Carter have to say ? Peer-Review Papers Skeptical of “Man-Made” Global Warming. At the science and public policy institute it appears the Scientific Consensus on Climate Change there is a less than impressive “head-count” essay, Naomi Oreskes (Oreskes, 2004), a historian of science with NO qualifications in climatology, defined the “consensus” in a very limited sense, quoting from IPCC 2001. The latest piece of evidence from NASA Blows a Gaping Hole In Global Warming Alarmism that just keeps coming supporting the fact that man has very little or virtually no effect on climate temperature . Just a reminder here folks we have to comprehend all tax indeed goes to a bank to pay our national debt either for unnecessary government borrowed expenditure that pays for our infrastructure or for a far greater crime by our political representatives who are merely attempting to inject or re inflate money back into circulation which is a sum of money ( principal & interest ) that has already been stolen & laundered out of circulation by all our commercial banks over the years who are purposely obfuscating our very own promissory obligations ( money creation ) we have to each other . Our current national debt is mathematically impossible to pay down thus the sum total of national debt represents a irreversible multiplication of artificial debt is only ever a sum of principal that once existed in circulation that’s of course perpetually stolen & laundered out of circulation over & over on our very own falsified debts only to be then loaned back into circulation again & again as a terminal multiplications of artificial debt to perpetually re-inflate circulation as we the people concurrently pay a sum of principal & interest out of a circulation ,which is a sum paid out of a circulation that’s only ever comprised of some remaining principal at the very most even upon further cycles of reflation hence the very reason why its mathematically impossible to pay down any former sum of artificial debt without dedicating ever greater sums of new artificial debt to always pay the former sum of artificial debt till in the very end & we are all dispossessed of all our property & wealth. Tax aside for a moment we also must not forget our political representatives have created preposterous invalid legislation deeming Co2 a pollutant & the ramifications subject to the implementation of these invalid laws can only remove the last of our liberties and freedoms . Mike Montagne explains inherent monetary failure under the world’s central banking systems… versus mathematically perfected economy. You can either view the videos individually below or go to the playlist on youtube. Posted by australia4mpe in How will MPE benefit you. • Not have to worry about money? • Not have to work so much that you don’t get to spend time with those you love? • Have 60% of your income to spend on whatever you liked? • Be able to get the money for a business and pay it down under the same system as above? • Never need to borrow money on credit cards again? • Not have ANY inflation, yes, that’s right, NO INFLATION — so the value of $1 today will be the same as it’s value in one hundred years…INCREDIBLE eh? • Live in a political system without corruption, where you get to choose representatives who are not funded by corporations & interest groups and who are there to represent you and your community? A National NON PROFIT Accounting Common monetary Infrastructure (CMI) that proves & demonstrates it commits no crimes against us will be established by UNITED PEOPLES MANDATE by the people for the people to handle all obligations / deposits (NO BANKS), credit / money will be created & issued at NO INTEREST by the people themselves via * unexploited promissory obligations * based on a simple 1.1.1 Second grade * EQUAL * math ratio where (1) All OBLIGATIONS are equal or no more than all remaining money in (1) CIRCULATION & equal to no more than all remaining depreciating (1) REPRESENTED PROPERTY VALUE. * Principal only for what its intended to represent * is paid down out of circulation at the rate of depreciation or consumption of the related property, its rightfully retired/deleted along with the remaining obligation until its fulfilled. The Non Profit CMI accounting which is * NOT A BANK * will be administered by public servants on the peoples behalf, however I must stress politicians have absolutely NO ability or power whatsoever to intervene or regulate the CMI outlined in the mandate, to do so in a manner without transparency or without the approval of the people first by a transparent referendum for example would be considered political betrayal by an act of treason & treated as such by law outlined in the united peoples mandate which is to secure Absolute Consensual Representation ACR™ of the sovereign rights of just individuals within any nation who actually choose to adopt MPE™ . PRINCIPAL HAS TO BE RIGHTFULLY RETIRED TO SOLVE CIRCULATORY INFLATION, ANY PRINCIPAL PAID DOWN OUT OF CIRCULATION ON A PROMISSORY OBLIGATION IS THE PROPERTY OF NO ONE’S TO KEEP. Remember MPE™ is a sovereign economy where No one is borrowing or loaning money from anyone because we create money (principal only) so its only a obligation then to pay & rightfully retire (principal only) that you created on conception to pay for the property you purchased in the beginning, it has to be rightfully retired at the rate you choose to consume property simply to solve circulatory inflation OR to prevent too much money in circulation. There’s no free lunch or unearned profits in MPE™, It is true one owes a true creditor ( someone who actually gives up property ) a like equal measure of ones own production over time for what production the true creditor gave up (EG: A house ) , however one is merely paying down out of circulation what one has paid in full to the true creditor from the outset of ones very own promissory obligation ( money creation ). No one is paying back as such because one merely pays with a like equal measure of ones own production for what one consumes of another’s production, which is rightfully retired, deleted, extinguished that guarantees the very integrity of the money circulating for its intended representation, which is most certainly not anyone’s to keep in fulfilling a promissory obligation, we give up & receive an equal representation of wealth to each other upon money creation, which also consists of the earned profit or entitlement from our labour & production we give up & receive from each other, without banks or government representatives intervening on our business & commerce stealing from us in the process. Once one removes from their psyche the *illusion of a loan* associated with the word *debt*, one can then remove the *illusion of a bank* associated with the word *money*. Only then do the people restore their rightful ability to promise to pay an *unexploited obligation*, with one’s own *labour and production*, for what one consumes of another’s *labour and production*… where there are no loans, no borrowing, and only as a result, likewise is there no interest.. Likewise money is NOT created as a debt in MPE™ either, simply because we as the obligor ( NOT BORROWER ) creates money ( principal only ) free of exploitation or purposed obfuscation to first pay the true creditor in full who gives up property & then the obligor likewise earns, & rightfully retires money, ( principal only ), with their future production at the rate of depreciation or their choice of consumption of the related property they purchased in fulfilling a obligation, money in MPE™ therefore only becomes a * principal debt * when we use it in the exchange of property or services, unlike today where money only becomes a * principal debt subject to interest * when we use it in the exchange of property or services, however unlike MPE, today’s money is stolen on conception creation by thieving banks who are purposely falsifying a debt to themselves by intervention upon our contracts with each other which is the core obfuscation & first crime a bank commits where the bank is neither risking or giving up consideration of its own commensurable or equal to the falsified debt it imposes, essentially stealing principal representation on conception creation of money , so in effect we are really exchanging our labour & production that the banks have already falsely claimed as their very own today by merely pretending to loan a sum of principal to the ” alleged borrower “ which is a sum of principal the ” alleged borrower “ actually created upon signing & issuing a promissory obligation * before any banking book entry *, thereafter the 2nd crime of unwarranted interest is imposed ONLY AS IF the bank risked or gave up commensurable consideration of its own. NOTE : Its preposterous even to entertain the idea of debt free currency because logically even barter itself or the act of exchanging property or goods ( which otherwise money represents ) is the very act of fulfilling a debt or obligation. See the origin of money. Even under today’s purposed obfuscation when one transfers property / collateral to an ” alleged creditor ” or bank, one can even discharge a falsified debt on already received property without one penny paid to the bank ? Money or the further representation in MPE will take the form of a debit card or cash or both, which is not only a debt instrument its a record of exchange that can also represent entitlement representing what one has given up . Any further representation in MPE™ will always equal the former representation of one of our very own promissory obligations , money therefore, will be then our very protection that represents a true record of our exchange, so we categorically know we are giving up an equal representation of wealth to each other, that’s unexploited evidence, of our promissory obligations we have to each other, ( money creation ) , however if you want to give away your money, or labour & production, you cant issue a promissory obligation representing nothing of value in doing so, rather if you want to give away money, it has to come out of your earned savings or your own pocket thus it will be your loss & your loss alone. Remember the promissory obligation & likewise any further representation or publication of money in MPE™ only becomes a * principal debt * when we redeem money in an exchange for property & or services, or the exchange of our labour & production to one another. If your not using the representation / money but in possession of it such as earned profit or savings in MPE™, its then merely a record of a prior exchange or former * principal debt * paid into circulation that evidences what someone has given up & likewise received giving up their own labour & production to another which is a true representation of wealth, ultimately backed by the liquidity of the property, or property value given up in the creation of money ( promissory obligation ) , but this does not necessarily mean ones earned profit or savings can represent ones own principal debt, rather it can also represent & record ones own wealth or entitlement if they have given up their labour & production in an exchange earning that entitlement or money , consequently earned entitlement or money in MPE™ only becomes a * principal debt * again when its used in an exchange & only then it can circulate further unimpeded to be earned & likewise retired on someone else’s unfulfilled promissory obligation. If I built a brand new house from the ground up at a cost of $70,000 in a Mathematically Perfected Economy™ with an estimated lifespan of 100 years ( which is no different to what current insurance companies do today estimating the price of anything really, only exception is when we actually look at MPEs obligatory schedule of payment we clearly see all property we consume, even a house depreciates at a rate we consume it much like everything else we consume just like today ) & I then decide to sell that brand new house for $100,000 consequently then that $30,000 excess on top of my cost is my * Earned Profit * which is * GREATER VALUE * that is most certainly NOT INTEREST but * Earned Profit * as a result where I gave up my labour /work & time to produce that house & what some one pays me for that house ( principal only ) by issuing a $100,000 promissory obligation ( money creation ) thus issuing 100,000 UNEXPLOITED DOLLARS into circulation upon the sale indirectly or directly is always an EQUAL representation of wealth we give up to each other, not that we give up to any publisher of money OR thieving bank who merely pretends to loan us money risking nothing of their own . Now on the other hand If I live in that house & neglect that house over a 20 year period of consumption then deciding to sell that house a respective buyer can then negotiate a price with me, if that buyer is smart they will see the neglect & offer me $70.000 instead of $80,000, & if I agree the house is refinanced by the CMI at $70,000 . Another likely scenario therefore if I add a NEW room on that house after 20 years of consumption, I may negotiate a value of $90,000 with a respective buyer & if the buyer agrees the house is refinanced by the CMI at $90,000, likewise if I add a second floor to my house I can even negotiate a value of $180,000 that’s indeed above any prior value, where its clearly ALWAYS WE THE PEOPLE WHO DECIDE THE VALUE OR THE RATE OF DEPRECIATION OR CONSUMPTION from the ground floor up when we produce anything in MPE™ really, in what will be a TRUE free enterprise market free of exploitation. Please let me be clear once again folks the obligatory schedule is a mathematical formula that proves it commits no crimes against us nothing more, where in fact the obligatory schedule, if one cares to even look at it proves to us all with logic & elementary 2nd grade math alone No one decides the value of property or our * labour & production * except WE THE PEOPLE because its we the people who takes all the risk & creates all wealth from the ground floor up , NOT the CMI , NOT any bureaucrat or government regulation & most certainly NOT any thieving bank who merely pretends to loan us money , the CMI again does not determine original or subsequent value of the related property, the builder , producer determines value; “buyer + seller”, based upon materials, quality, workmanship etc, which may include any subsequent additional value attributed to the related property, before a proprietary determinate life span can be applied or reapplied. For example If you bought a * NEW * house in a Mathematically Perfected Economy™ for $100,000, with a projected lifespan of a 100 years consumption & you paid down $100,000 sooner over 50 years rather than the projected 100 years the CMI will still retire the $50,000 you already paid in advance ( still in your account otherwise as savings ), retired therefore, at a rate you consume the remaining lifespan of the house you purchased, still adhering to MPEs 1.1.1 ratio. So If one Pays down $2,000 instead of $1,000 a year on a $100,000 home with a lifespan of 100 years you consequently then own that house in 50 years instead of 100 years , likewise if you pay down $5,000 a year you own that home out right in 20 years , again if you pay down $10,000 a year you will own that home outright in 10 years, keeping in mind whatever you pay above your consumption stays in your own savings account ( ITS NOT STOLEN BY A THIEVING BANK ) & you see it being rightfully retired as you consume the remainder of the house & at any stage for any unforeseen circumstance you need do draw on that money you paid in advance sitting in your own account you can. However If one did choose to pay down their obligation faster not touching the money in their account, one wouldn’t be spending that money one could otherwise spend on other things such as family, holidays or * EVEN A BUSINESS ? * & as a result expanding business, employing more people or even paying more to employees etc , the list is endless , we won’t be wasting vast amounts of natural resources because business will be paying their principal debt down at the rate of depreciation or consumption so naturally things will be built to last longer resulting in lower rates of payment over the lifetime of what is purchased to retire money, likewise unemployment will be by choice, NOT imposed ,competition will also flourish keeping the price or cost of production competitive in what will be a true free enterprise market based on innovation rather than built in obsolescence & a throw away society. If you decided to sell your house that you paid in full after 50 years you keep the remaining value of the house which is $50,000 free of taxation or exploitation & it’s yours to spend if you wish because you have already paid for a house in full your no longer consuming , however whoever buys your house ( second hand ) after 50 years issuing their own promissory obligation likewise takes on the remaining $50,000 obligation & pays down the remaining consumption left on the house as they consume of it in the same manner you would , even if one pays for a house directly from savings or earned profit without issuing a promissory obligation that money paid stays in their own account & its retired as they consume the remainder of the property. Now if one pays for a house directly from savings or earned profit ( without issuing a promissory obligation ) on purchasing unrepresented property produced from another’s earned profit or savings one owns their house outright on the purchase where one is merely circulating the money further so it can be earned & rightfully retired on someone else’s obligation, which is much the same or the exact same manner as buying your groceries at a shop circulating the money further so it can be earned & rightfully retired on someone else’s obligation, either way money is created by the obligor for representation regardless when its needed without any intervention or regulation whatsoever , no matter how fast one pays, the CMI always proves & demonstrates to you its rightfully retiring ( NOT STEALING & LAUNDERING ) the principal from your account at the rate you choose to consume the remainder of the property you purchased. Most if not all employees wages or salaries in MPE will be paid out of the employers profit line ( earned profit ) , if we ignorantly did choose to represent all our production a employer would have to issue a promissory obligation to pay his employees wages so as to circulate money further?, not to mention having the hassle or inconvenience of putting up something he owns as collateral in doing so when it could cost him less using the services of the CMI if he just paid his employees wages out of his earned profit margin to likewise circulate money further, in what would be a true free enterprise market , likewise unrepresented labour (also earned profit ) in production can be represented on the finished product if someone issues a promissory obligation to purchase the finished product, when money is needed, that one otherwise does not have ,without the need for any regulation whatsoever . Now In the case where an employer is just starting a new business he can collateralize something he already owns ( which can be money sitting in his account or unrepresented property ) so as to issue a promissory obligation to pay employees wages until his profit margin is sufficient enough to sustain any paid wages & of course pay down his promissory obligation . The only taxation we pay in a mathematically perfected economy™ is in the cost of what we pay to use public infrastructure where we pay down ( not back ) & retire the principal that builds public infrastructure at the rate we consume or use that public infrastructure, much the same as we pay down our own private obligations, there is NO NATIONAL DEBT in MPE™ because government representatives who work for the people ( not banks ) issue a promissory obligation on the peoples behalf which is subject to the peoples recommendation first & consequent affirmation & re-affirmation thereafter that actually allows government representatives to build public infrastructure on the peoples behalf free of terminal exploitation, so naturally then its we the people who likewise pay the principal down from circulation at the rate of our consumption or use of that public infrastructure so it can be rightfully retired ( NOT PAID TO A THIEVING BANK ) that is absolutely no ones to keep, paid down in the same manner & process as we would pay down circulation ( principal only ) on our very own * private * obligations at the rate of our own consumption to be rightfully retired also. Public bus’s may have a percentage of the ticket sales that pays down & retires the circulation that built those buses, roads may likewise be paid down at the rate of our consumption in the cost of fuel which I may add will be much less than what we pay for fuel today, the cost of fuel today is high simply because its cost at the pump is mostly comprised of tax that’s paid to a thieving bank for unnecessary national debt which is mathematically impossible to pay down. Once again we only pay for what we consume in a Mathematically Perfected Economy™ , if you don’t use or consume public infrastructure your consequently not taxed, therefore taxation in MPE™ is fair across the board & absolutely discriminates no one. The proof of one & one only Mathematically Perfected Economy™ is a singular integral solution for 3 categoric faults. 2) Systemic manipulation of the cost or value of money & property. 3) Inherent irreversible & therefore terminal manipulation by a irreversible multiplication of falsified indebtedness by unwarranted interest. The solution is therefore an obligatory schedule of payment retiring principal at the rate of consumption or depreciation of the related property & a complete eradication of interest. The meaning of ” inflation ” is to increase but its an abnormal or distorted increase, so there is NO such thing as inflation & deflation in MPE because there is no distortion or abnormality ,even circulatory in nature neither a increase or decrease of circulation is abnormal or distorts the availability of the remaining volume of circulation that it was intended to represent in relation to remaining property value & remaining principal debt /obligation which are balanced or always equal at all times . With the total eradication of interest In MPE we have no price inflation on a whole because the interest imposed on all our business & commerce today that’s likewise passed onto the consumer is non existent in MPE . Circulatory Inflation & deflation therefore just doesn’t happen from the get go in MPE even when an obligor issues a promissory obligation for new represented property that issues new money into circulation simply because this increase of circulation is immediately equal to the remaining principal debt & remaining value of the property that the obligor purchased so long as the obligor retires principal at the rate of their consumption there is NO inflation or deflation. Deflation is to reduce or a reduction in the availability of circulation resulting in a deficient circulation . so in MPE we don’t even have deflation or an insufficient volume of circulation simply because we will always have exactly the required amount of money per representation available left in circulation to pay down & retire the remaining principal from circulation in servicing any outstanding obligation , balancing then circulation equal to the remaining obligation & equal to the remaining property value . Circulatory Inflation & Circulatory deflation therefore means there is an adverse volumetric impropriety that exists in the remaining availability or volume of circulation for what it was intended to represent which is a volume of circulation that’s abnormally above or below its intended representation, therefore the remaining volume of circulation is not balanced or not equal to the remaining property value & not equal to the remaining obligation or principal debt. Please see the video below . Thank you . The mind boggles to think of the benefits to everyone in any country that adopts this economy and we can then begin to imagine an end to poverty, deprivation, wars, monopolies, pollution and, in fact, most of the ills that plague our present world. There would be no need for constant ‘growth’ fuelling the creation of false needs and rampant materialism, built-in obsolescence of goods or our purposefully designed ‘throw-away’ society. We can close our eyes and dream the rest. Recommended videos relating to the above video regarding obsolescence & population concern . 3) Inherent irreversible & therefore terminal manipulation/multiplication of falsified indebtedness by unwarranted interest. 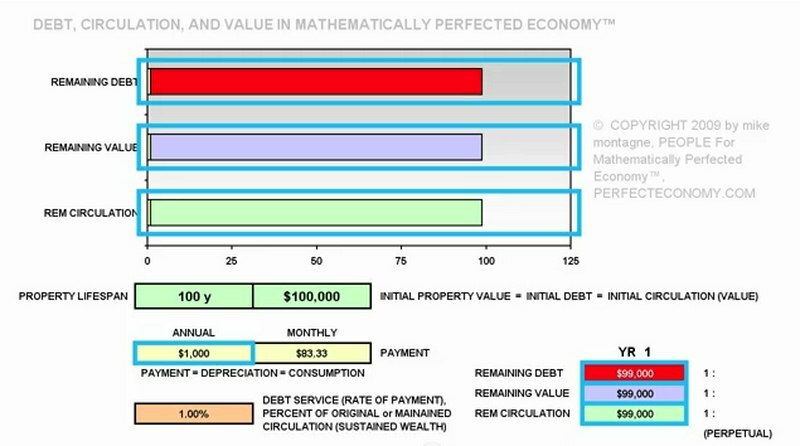 The solution is an obligatory schedule of payment retiring principal at the rate of consumption or depreciation of the related property & eradication of interest by maintaining a perpetual 1 to 1 to 1 relationship between remaining circulation (C), remaining value of represented property (RV) and remaining Obligation (RO) to pay just ” so much ” for the remaining value of the represented property. “Former” as an adjective tends to be used for something that is over and done with being the first of two I have mentioned which is the result , whilst “Prior” indicates something preceding that is still going . Former the result C = RV = RO & Prior being C – CRP + NRP . PEOPLE For Mathematically Perfected Economy™ (US, UK, and Europe) has filed a FOI inquiry to which the purported Bank of England is compelled to answer HOW IT RIGHTFULLY CLAIMS DEBTS TO THE BANKING SYSTEM EXIST IN NO MORE THAN PUBLISHING EVIDENCE (OR FURTHER REPRESENTATIONS) OF OUR PROMISSORY OBLIGATIONS, in the processes by which “the bank” purportedly creates money (or monetizes our production by no more than publishing evidence of our promissory obligations). In this case we have seen varied responses and have sort independent advise from a gentlemen by the name of Mike Montagne — founder, PEOPLE For Mathematically Perfected Economy™, author/engineer of mathematically perfected economy™ (1979) who has kindly advised that the worlds economies are finite and that regulation in the UK by the FSA & MPC can only temper an inherently terminal process. 1) What lawful consideration do you claim the BoE gives up when it creates money ? 2) How then does the bank (or does the bank) claim there is a debt to the bank ? 3) What is the claim to interest then, when the bank can do no more than absorb the costs of merely publishing evidence of our promissory obligations *to each other* ? accumulating inevitably terminal sums of debt ? Please we do not require evasive in answering to *whether* money is subject to interest in any regular conduit by which either the government or the people can “borrow” “money” into circulation. Of course currently we know well that there’s no way we can acquire “money” from “the bank” but by “borrowing” it (even as in the beginning or its creation, it never existed before), and that of course, “the borrowing” is currently subject to “interest.” Furthermore then, If the BoE claims (without demonstrating *how*) that interest is charged to fight “inflation” (by which it means *either* circulatory inflation, or [more likely,] *price inflation*). But of course, if staving circulatory inflation were the issue, it would just limit the amount of additional borrowing (above what would only *maintain* the vital circulation). On the other hand, if it were actually meaning to eradicate *the additional costs* imposed upon “the economy” by *price inflation*… then instead of imposing interest, they would eradicate interest, because in multiplying the sum of artificial/falsified indebtedness to the BoE, “interest” therefore *is the cause* of price inflation, because in driving up the costs of servicing debt, these costs, imposed upon industry, force industry to raise its prices, merely to maintain vital margins of solubility. Please if you could answer the above four  questions ONLY points by point. ‘1) What lawful consideration do you claim the BoE gives up when it creates money ? 2) How then does the bank (or does the bank) claim there is a debt to the bank ? 1. Money performs various functions that are of benefit to its users: it acts as a store of value, as a medium of exchange and as a common unit of account. 2./3. Assuming (based on the themes you raise in the paragraphs that follow your questions) that these two questions relate to the Bank of England’s implementation of monetary policy, please see the explanation on our website at www.bankofenqland.co.uk/markets/sterlinqoperations/monetarypolicv.htm and www.bankofengland.co.uk/rnonetarvpolicv/how.htm 4. The effectiveness of money’s functions, including as a medium of exchange, is maintained by the Bank of England carrying out its responsibilities for monetary and financial stability. Please send intended URLs if these are not the pages you would claim answer our questions. While these logical corrections would concur only with the corresponding URLs, we assume however (despite their unaccountable content) that you are perfectly aware that neither of your cited pages even provides the scantest hint how the purported Bank of England in fact could give up any thing of value, equivalent to the debt the bank claims to create to itself when it purports to create money. An entirely unequivocal, conclusive answer to our first question of course would be incumbent upon any purported banking system or government which nonetheless pretends to serve the subject people, for the natural, lawful, and legitimate cycle of promissory obligations is of course far different than the obfuscation your purported bank imposes upon us. We believe all reasonable people will deduce accordingly therefore that your evasion of our first vital fact of no lawful consideration and no commensurable fact of debt purposely circumvents admission of a nonetheless obvious fact that the purported banking system creates money by no more than publishing evidence of the peoples’ promissory obligations to each other. Obviously too then, your evasion is an inadvertent indication that you are powerless to argue otherwise, for certainly you would have taken up the opportunity (and obligation) to prove a fact of lawful consideration, particularly as that fact would naturally be so obvious, were you prepared to justify the consequences of your purposed obfuscation of our currency. Your cited pages in fact however do not even provide the scantest hint that the Bank of England itself even considers it incumbent upon itself, even to make a reasonable effort to explain how the resultant, falsified debts could possibly be justified either by lawful consideration, or by any other reasonable rationale. You too, remarkably, deny us any reasonable answer which could possibly justify the very concept the principal is ever the rightful property of the purported banking system. Therefore the only reasonable deduction in regard to this further concerted evasion of vital justifying arguments, is that the existence of the bank is itself perfectly well aware that the obfuscations of the bank were never even intended from their inception to serve the people who are forced instead to suffer the banking system’s purposed injustices, as a consequence of your purposed obfuscation. Yet obviously, there is neither any presumable nor any indicated lawful consideration in the bank’s obfuscation of our promissory obligations into falsified debts to the purported bank, for the real creditor gives up property for the promissory obligation; and the resultant obligation therefore is to pay and to retire principal from circulation. While it claims otherwise, even in the very propaganda you have pointed us to, nonetheless then, the purported banking system is not even a real creditor. In fact then, not only does the banking system give up no lawful consideration in obfuscating this obligation to retire payments of principal from circulation (which in turn are the property of no one); nor therefore is there any commensurable property of the bank at risk which could even possibly, ostensibly justify interest. If we could possibly be in error in these careful deductions, please therefore furnish exactly which passages of the cited documents indeed conclusively resolve these issues otherwise. Otherwise let it be recorded then, that as we are also aware, neither your cited pages, nor any other prior material answer any of our other vital questions. We therefore anticipate that you well understand the motives of your evasion, in fact because, if your obfuscation of the currency were justifiable, and of course if you did not already know that it is impossible to justify it, you could have simply answered what lawful consideration the purported bank indeed gives up in the creation of money. As there is none, neither then could you answer directly that there is any. Knowing yourself so, and participating in that obfuscation for your own livelihood, nonetheless you steered this vital test of integrity to documents which don’t even venture the direction of resolving these issues. c) whether the inevitable consequences of your obfuscation of our currency are the product of just processes, which indeed would serve the people (which is only your intention if you acknowledge and endorse the only processes which serve the people). We know of course that the latter cannot be true, unless the present, simultaneous, global monetary failure were in fact a reasonable anomaly of nature — that practically every country of the world should succumb to terminal, artificial indebtedness, while natural resources remain unexhausted, and we remain as disposed and capable as ever of persisting instead in the prosperity which the people remain still so capable of. We are also aware of contemporary strategies which only attempt (equally vainly) to misrepresent cause, while the fundamental cause of all the conditions before us is readily traced to your obfuscation of the currency. But if this unnatural condition of the present failure were not caused by your obfuscation of our currency, Mr. Norman, what in fact could it truly be caused by? 1) What lawful consideration do you claim the BoE gives up when it creates money? Obviously there is none. If the bank gave up lawful consideration in its falsification of indebtedness to the bank in the course of no more than publishing evidence of our promissory obligations to each other, the debtor would have to receive so much as the acquired property from the bank itself. Instead, the purported debtor (actual obligor) receives so much property from the actual creditor, in exchange for the promissory obligation, which in turn is used as currency, representing an obligation to pay and to retire the principal of the related property. 2) How then does the bank (or does the bank) claim there is a debt to the bank? Obviously, even as you gave no answer demonstrating how the bank could rightly claim there is such a debt to the bank, the bank simply claims there is a debt to the bank; the banking system never demonstrates how, in the creation of money (monetization of our production), the bank obfuscates our promissory obligations to each other into falsified debts to the bank. In fact, the probable reason the bank never provides such arguments is of course that the obvious inconsistencies of any false argument would engender the present opposition. 3) What is the claim to interest then, when the bank can do no more than absorb the costs of merely publishing evidence of our promissory obligations *to each other*? Obviously, even as your cited articles fail to raise any accountable argument whatsoever, being as purported risk of principal ostensibly justifies interest, and as the principal neither represents a debt of the obligor to the bank, nor is even the rightful property of the bank, interest cannot be justified to the bank (which likewise denies interest to every real creditor), because in fact, the only cost to the bank is the mere negligible cost of publishing no more than evidence of our promissory obligations to each other. 4) How is it possible even to maintain a vital circulation without accumulating inevitably terminal sums of debt? As a direct consequence of this purposed obfuscation of our promissory obligations, an implicit obligation exists to maintain a vital circulation, the means of which, owing to the obfuscation, are generally only that unwitting subjects of the obfuscation are perpetually compelled to borrow further. In other words, the purposed obfuscation results in perpetual payment of interest and principal out of a circulation which at any time can be comprised of no more than some remaining principal. Thus the unwitting subjects of such a system cannot even continue to service even the initial falsified obligations of the finite lifespan of such a system, unless they perpetually, sufficiently reflate the circulation of so much as the principal and interest they are paying out of circulation in the way of servicing any existent sum of debt. What principal they are thus compelled to borrow back into circulation as new debt, equal to the prior debt it might be presumed otherwise to resolve, thus persists in any former sum of debt, making it mathematically impossible to pay down the sum of debt so long as principal can and must be re-borrowed, merely to maintain a vital circulation. But what interest we are compelled likewise to borrow back into circulation therefore perpetually increases the sum of debt by so much as periodic interest on an ever greater sum of falsified debt. Thus the sum of artificial debt increases even at an inherently ever greater rate, until a terminal sum of debt which not only exceeds the subjects’ remaining capacities to service it, but likewise exceeds any possible credit-worthiness to borrow further, as remains necessary nonetheless to maintain a vital circulation. As this is the very intrinsic process which inevitably manifests in the present conditions, Mr. Norman, therefore you must be aware that you are participating in one of the greatest crimes against your fellow man in history. We presume indeed then, that this is why you cited the bank’s own hollow propaganda (via errant links no less) as answering questions which the bank of course would hardly be inclined to answer ever, truly, because the very responsible process is the whole purpose of the purported bank. 1) Do you claim still that the bank gives up lawful consideration commensurable to the usual debt claimed by banking systems in obfuscating our promissory obligations to each other? 2) And if you dispute any of the above arguments, what conclusive arguments can you provide, respectful of our rights to issue promissory obligations free of *your* terminal exploitation? Thank you for your further e-mail dated 29 June. I thought I had answered your earlier questions in my letter dated 16 May. That said, I was giving answers that relied on interpreting your questions, because, as you have written them, I find them unintelligible. The same applies to the two “immediate questions” in your latest e-mail. If you wish to proceed with this Freedom of Information Act (FolA) request, please could I ask you to re-formulate your questions in such a way that they are a clear request for recorded information (which is what the FolA gives you a right to ask for)? Regarding the rest of your e-mail, please may I draw your attention to the WhatDoTheyKnow.com advice (“Why must I keep my request focused?” – available at http://www.whatdotheyknow.com/help/requesting) which says “Please do not include…arguments about your cause”. As such, I have not focused on what you have written in the rest of your lengthy e-mail, although I am content to confirm that the weblinks I gave in my 16 May reply were indeed intended to take you to the two pages that you have identified in your 29 June e-mail. Your right to complain under the Fol Act If you are unhappy with the Bank’s response you may ask for that decision to be reviewed internally. In order to do so,please set out the grounds for your appeal and send it to Wendy Galvin, PEG (HO-M), Public Communications & Information Division, Bank of England, Thread needle Street, London, EC2R 8AH or by email to enquiries (5iba nkofengland.co.uk for the attention of Wendy Galvin. If you are not content with the outcome of the internal review, you have the right to apply directly to the Information Commissioner for a decision. The Information Commissioner can be contacted at The Information Commissioner’s Office, Wycliffe House, Water Lane, Wilmslow, Cheshire, SK9 5AF. Of course, we have the BoE quite cornered here in what are certainly the most important monetary issues. Please understand that although we certainly believe that our response is conducive to answer, nonetheless (for obvious, yet stated reasons) we do not really expect ever to get credible answers from the BoE. In truth then, the intentional strength of wording and overall resolution are instead intended to prove these facts to the people in such conclusive detail that the people in turn finally understand not only that these are the hinging issues, but that the purported banking system has no defense against our irrefutable arguments of criminality and singular solution. Here again are our four questions. In response to your dispute that they fail to request recorded information, following each of our original questions, I provide revised versions detailing what recorded information is requested (as requested, but which of course may not make the obvious questions any clearer than each already are). In response to your assertion the questions are unintelligible and unfocused, I further provide brief explanations of the intelligibility of each question directly beneath the original and revised forms of each, that it is reasonably incontestable that each are exceedingly focused and intelligible. Should further clarification of intelligibility or focus be required, particularly as you have raised no specific issue of non-intelligibility or lack of focus, I provide such substantial further explanation of the context and nature of this inquiry beneath our re-submission of the same questions, that particularly in this further explanation, little possible genuine reason could remain to contest either intelligibility, focus, or what kind of permitted material the questions indeed ask for. These indeed then are explicit formal requests for recorded information. 1) What lawful consideration do you claim the BoE (Bank “of” England) gives up when it creates money ? 1R) What lawful consideration (property of commensurable value), equal to the money created (which is the principal) DOES THE PREVAILING RECORDED INFORMATION claim the BoE gives up when it creates money ? This is a plain question, related to world-wide practice of contract law (which therefore would relate to obfuscations of our promissory obligations imposed practically anywhere in the world), which plainly demands to know what thing of value the bank gives up to every purported debtor in the creation of money (not in purportedly loaning out already existing “money” otherwise, *later* claimed to be the property of the purported banking system). In other words Mr. Norman, if the purported bank does not give up something in the creation of money which is commensurable to the debt it indeed claims it creates, there is no debt according to regularly recognized contract law (which principle, we understand, the bank nonetheless may claim to operate in authorized defiance of). 2R) WHAT PREVAILING RECORDED INFORMATION INDICATES HOW the bank claims, or whether the bank claims, debts to the bank exist in the creation of money, in respect to producing further representations of our promissory obligations, and in respect therefore to the lawful consideration (property of commensurable value, equal to the principal) the bank may or may not claim to give up in producing further representations of our promissory obligations, which in turn are to circulate as purported money? How could any banker claim our original question is unintelligible? Does the bank claim a debt results to the bank, in the bank’s purported creation of money, as a result of its obfuscation of our promissory obligations? Or does it not? Of course it does. The bank does not destroy or retire the payment of principal, *never* claiming the principal is the property of the bank, or thereafter somehow becomes the property of the bank, does it ? Indeed the bank claims debts equal to the principal are owed the bank; but how so; for exactly what lawful consideration (giving up of original property of value, equal to the principal created)? 3R) WHAT IS THE PREVAILING RECORDED INFORMATION, indicating and justifying explicitly what are the banking system’s claims to interest then, particularly if the banking system has no actual material contribution to the creation of money in respect to our issuance of promissory obligation than absorbing the negligible costs of merely publishing evidence or mere further representations of our promissory obligations *to each other* ? Possibly you simply presume it is unquestionable whether the banking system gives up lawful consideration commensurable with the debts it claims in its production or publication of mere further representations of our promissory obligations. Quite possibly you simply presume that the process of creating money (or monetizing our production) should be universally mis-understood somehow to naturally, legitimately, lawfully or otherwise satisfy needs to clarify and to justify how your obfuscation of our promissory obligations can and should result somehow in actual debts to the purported bank, for this misunderstanding is certainly regular practice; it is likewise the common misunderstanding of dupes, even as no submissive dupe can their self explain how their promissory obligation to pay principal from circulation can rightly be obfuscated instead to a purported debt to the purported banking system. But particularly owing to the ramifications of this process, and thus to our experience how this obfuscation has multiplied falsified debt into terminal debt across the world, the question is not therefore unintelligible. In fact on the contrary, the whole possibilities of vitality, justice, or inevitably terminal monetary failure hinge on this question. The question pertains to how, given whatever credibility of your possible claim that the bank gives up lawful consideration, you might claim interest is justified by property which is quite obviously, questionably either the pre-existent, justifiable property of the bank, or a representation of the bank’s possession — for certainly either possibility is questionable when the purported money (or rather, device) is only created representation of our own promissory obligations, which in turn then are obfuscated into falsified debts to the purported banking system, which falsified debts (or evidence of possession) in turn are only wrongly said to comprise risk, purportedly justifying interest. Obviously, if there is no lawful consideration given up by the bank, not only is there no actual debt to the purported banking system; no property of the bank even exists as could be subject to risk, ostensibly justifying interest. To resolve these very intelligible questions then, it is helpful (if not a reasonable obligation of the bank) to have the banking systems’ official answer, for if the banking system truly exists as a benefit to the people, as opposed to a device of their destruction, the former fact hinges upon whether the bank could rightfully launder principal into its possession, only upon which fact it could rightly claim interest is justified in multiplying otherwise falsified debts to the bank into terminal dispossession and failure. Obviously then, we believe even that the bank has an indispensable interest in answering this question most conclusively, for otherwise, the entire remainder of humanity would be compelled to recognized the gravest crimes against itself, perpetrated in fact by evident, purposed falsifications of purported banking. 4) How is it possible even to maintain a vital circulation without accumulating inevitably terminal sums of debt ? 4R) WHAT IS THE PREVAILING RECORDED INFORMATION THEN, further hoping or purporting to justify any obfuscation of our promissory obligations by detailing how is it possible even to maintain a vital circulation without accumulating inevitably terminal sums of debt, as a consequence of imposing interest against risks which obviously could not exist unless the principal of newly created money, merely instead representing our promissory obligations, is not even the rightful property of the bank (which it cannot be, if the bank only claims falsified indebtedness, without having given up lawful consideration) ? This question too is obviously intelligible and germane, as of course is already explained in our description of how the resultant obfuscation of our promissory obligations inherently produces the present global failure. In providing an accountable answer, recorded documentation would have to demonstrate how it is both possible and plausible to otherwise replenish the circulation. The questions therefore Mr. Norman are indeed very serious and focused; and the stakes of the answers are no less than we have quite carefully explained. Moreover Mr. Norman, particularly as we who are forced to assume the falsified debts can be aware of no commensurable property given up by the bank, it nonetheless cannot possibly be our cause even to oppose you, if you confess what indeed appears to be obvious self evident facts, that we can resolve the resultant issues and move on as an intelligent, disciplined, and just public would. Are you unwilling to do that? Neither we nor our questions are going away, Mr. Norman. These questions will remain germane throughout all further ages, which will judge us on how the answers duly supplied by the Bank “of” England truly answer to any questions of justice and terminal failure — which questions of course are evident in everything around us. There are millions of reasonably concerned citizens already who are certainly interested in the vital answers to these questions. And certainly there will soon be billions more, for a world already bearing the weight of terminal sums of debt which your obfuscation can only multiply further beyond us, is certainly at least doomed to wake. If the business of banking were truly conducive to the general, common purposes of society (which purposes at least are to prosper to our capacities, and without denial of just reward for our production), first I suppose it would be gentlemanly in return to thank you for your fourth of July email and PDF, which of course again responds not to our questions, but in which, instead, you pretend to justify your evasion by merely asserting that our questions were unintelligible; that they are unfocused; and that they don’t even request recorded material. The reason you have not answered these fundamental questions is they are so focused and conclusive as to inspire world-wide indignation, should you be unable to provide satisfactory answers — which of course is impossible, because the afore-described obfuscation is absolutely unjustifiable. We indeed even expect that you will never answer to our satisfaction, not because (as you have intimated) you are not obligated to respond to unfocused, unintelligible requests for veritable opinions or tenets of banking, but instead, are only obligated to respond to requests for recorded information. Thus in order to comply with the restriction you evidently intend to exercise, we indeed have even provided versions of our same questions which in each and every case indeed request the stipulated, recorded information. If it were the case nonetheless that our questions are in fact unintelligible, we wonder still how it is, that in this further reply, you on behalf of the bank do not instead ask for clarification of whatever expressions or concepts may have been perceived in fact to be unintelligible. Obviously nonetheless, regardless of any purported question of intelligibility, the documentation your response cited could hardly explain or justify either the bank’s rightful monetization of our promissory obligations, or, on the other hand, what would have to be its obfuscation of monetary process… for, just for example, neither your cited documentation nor any other historic documentation which even the most diligent scholars can be aware of, ever explains a very plain thing — whether or not the purported bank ever once gives up lawful consideration in the creation of money, commensurable with every debt the banking system obviously does indeed claim from us. It is not even difficult to answer these questions then, Mr. Norman. As we have carefully explained however, both the whole fate of the world, and even a purported fact or possibility of representation in governments installed to power always to preserve this ever unjustifiable obfuscation despite its perpetually unjustifiable consequences, hang in the balance of the answers to these four questions. You merely declare furthermore that these questions are unintelligible. But the reasons you might do so, too, are plain. Our subsequent questions were even plainer, for they merely ask first yet again if indeed you do claim the banking system gives up lawful consideration in the creation of money; and in turn, whether and how you dispute any of the obvious related facts to the answers to those questions, which we anticipated and provided in lieu of your refusal to answer, in our own open, truthful disclosure to the bank. We of course nonetheless, perfectly well understand how and why a willful disclosure of justifying answers to these due questions may never be offered by any purported banking system, for these questions reveal the very adverse core purposes of purported banking; the answers to which therefore invalidate not only everything about purported banking, but even the claims of the purported banking system to collect upon its falsified debts. Your bank nonetheless at least purports to account for all sorts of complex phenomena, even as, in the interest of clarifying the intelligibility and context of our questions, we have shown how your bank and its fellow banks around the world can only be the very cause of the present global depression. Is it true then that you have no more defense against the obvious facts than to merely assert without qualification that these plain questions are unintelligible, and that you have no responsibility to respond to arguments? Our questions are not just a cause, Mr. Norman; they are questions of your legal and/or otherwise legitimate authority to perform the role you do in the issuance of money. The facts of that role are not themselves a cause, Mr. Norman; nor is to state the evident case in the interest of clarifying context from the outset, essentially or strictly to argue cause. Nor is to state those facts as they are perceivable, to argue cause. These are merely to openly clarify the very things we ask of you: what indeed are the facts at hand? Nor then is it our cause to merely assert or complain that you do not give up lawful consideration in the creation of money. We ask under FOI privilege because obviously, it is rightful that the people know the answers to these questions. If the bank has no argument which would justify its existence, most particularly against a fact of such a destructive role as it indeed appears to play, then still we would expect that a decent respect for the opinions of humanity would at least compel you to answer at least to whatever extent you can, even if no recorded information answers any of these questions for the obvious reasons the object of unjustifiable dispossession is the very purpose of purported banking, for willful admission would put purported banking into a better proper perspective than to hide behind purported technicalities as if they insulate purported banking from duly answering — for the latter instead intimates not only knowledgeable, but even persistently intentional guilt. Thus we have already explained the intelligibility and focus of these questions, because in fact this critical obfuscation of our promissory obligations denies us economy by perpetually multiplying costliness in the form an irreversible, perpetual multiplication of falsified indebtedness into terminal indebtedness. This surely instead is a very antithesis of actual economy — which on the contrary would be comprised always of a vital eradication of all redundant and unjust cost. If on the other hand you defend the cited obfuscation of currency, then defend it by answering the questions, which are obviously germane therefore to diligent consideration. Our purpose was not to argue with you; our purpose of this FOI inquiry in fact remains to get plain, factual answers to the submitted questions, which of course are important to documenting the bank’s claimed answers to these questions, or its refusal to answer these questions — the latter of which of course, you have already provided. We understand of course, how and why you may strive simply never to provide commensurable answers. After all, if your present objection of non-intelligibility were warranted, you likely would have raised non-intelligibility in response to our first inquiry; and no one in the world could readily understand the context and implications of these questions. But they are already part of a global dialog, focused upon and perceiving the disposition of your response. In respect to this global audience ourselves, we have already in our first inquiry carefully provided the background against which we ask these critical, intelligible questions. We have explained how, according to the pattern exercised by the bank (as we the subjects of the pattern can understand from the facts at hand) we, the actual obligor (as opposed to purported debtor), issue a promissory obligation; how the real creditor gives up the property we acquire for a promissory obligation; and which promissory obligation can only rightly suffice as currency if the integrity of the obligation is maintained. If the value of money increases or decreases for example, either the real creditor (who acquires the money) or the obligor (who is obligated to pay it out of circulation) are damaged. These too of course are issues which are to be resolved in the perfection of economy. And yet sir, is the legitimate and very attainable perfection of economy something we are simply to refrain from, merely to preserve a terminal system of exploitation solely for the sake of what we errantly call “banking”? We plainly maintain from the facts at hand that the purported banking system gives up no lawful consideration whatsoever, even in the purported banking system’s obfuscated process of monetization. In the creation of money in fact, it can no more than absorb some negligible cost of publishing what is no more than a further representation of our promissory obligations. In an interest in actual justice, we have provided the purported banking system with an opportunity to put to rest our only plausible perception that a purpose obfuscation of natural monetization processes is in fact terminal to the natural, common interests of subject people. Already resolving any genuine questions of focus or intelligibility, we have already explained how the purported banking system obviously does not give up anything of commensurable lawful consideration in the arrangement, because of course, if we purportedly borrowed money from the banking system to purchase a house for instance, which money of course must be created before it can exist in any other fashion or possession, and in which creation neither does the banking system give up any commensurable lawful consideration, then of course there is no real debt to the banking system at all. Instead, as the real creditor has been paid in full (only so long too as the integrity of the resultant currency is maintained), the nature of the remaining obligation instead is to retire paid principal from circulation. Paid principal therefore Mr. Norman, would be the rightful property (or representation of property) of no one. You now tell us these questions are in your opinion, unintelligible. Would you answer our four questions conclusively, if we just re-submit them to you then without any background whatever indicating what truthful answers must account for? Obviously, these questions pertain to the very validity of purported banking. It hardly is likely that justifiable banking practice (or creation of “money”) exists then, without the very answers we are asking for. Presumably then, this is the very fact for which you have intentionally avoided providing any facsimile of an answer at all. We further explain in our subsequent response to your first evasion, that obviously, the banking system *does* claim there is a debt to the bank as a consequence of this obfuscated process of creating money. That question, “does the bank claim there is a debt to the bank?” could not be plainer, could it? Are you, indeed yourself a banker, possibly *unaware* that the banking system claims debts exist to the bank as a consequence of the process of creation of money? Is the concept of this question still unintelligible to you? Answer then how we can make the question understandable to you, a banker, with respect of course to the monumental implications of the question’s obvious answer. Of course the banking system claims there is a debt to the bank as a consequence of no more than publishing evidence of our promissory obligations to each other — which obligations instead are not the property of the bank, but on the contrary are obligations to pay and to retire principal from circulation (because fulfilled promissory obligations on the contrary are no longer evidence of value or commitment to deliver so much value in fulfillment of the obligation). This again, Mr. Norman, is not an argument of an ostensible cause which we haven’t even declared to you; this is merely the very explicit consideration a worthy answer must account for. Obviously, if the bank does not give up lawful consideration (something of value equal to the debt in principal it claims to create to itself), the bank in fact then has no rightful claim to the principal. Instead the principal should be retired, according to the natural life cycle of a promissory obligation (the *case* for which we are prepared to present to you in further invalidation of the integrity of potential answers, should you contest the issues either by mere theoretical assertions, *or in recorded material*, which indeed we do request of you). So these are the foci of our questions, Mr. Norman, as you have requested we reveal to you, and as we have no interest in attempting somehow not to disclose these vital foci to you, for this very set of questions is in fact critical to the very rightful destiny of all men. We doubt therefore that the exceedingly explicit focus of these questions has in fact escaped either yourself or the opinions and strategies of the purported banking system, Mr. Norman, even as you needlessly remind us to keep our request focused. We ask then, if you still maintain a lack of focus exists, where in fact is the lack of focus, either? Thus it is your remarks and evasion which themselves have asked for this clarification; and of course, in procuring these answers then, we are obliged to explain only as we have. How could we better explain that focus to you, Mr. Norman, particularly if you even contest it? What after all, Mr. Norman, equivalent to a home, do we receive from the banking system in assuming a promissory obligation for the principal of a home? How is it justified that we may be forced to pay many, many homes for each home which only we the people produce — in turn paying all this to a purported financial industry which produces nothing but mere further representations of our very own promissory obligations, and for which in the end, instead of resolving obligations to pay and to retire principal from circulation, and merely for an implicit obligation to maintain a vital circulation all the while (which forces us to borrow principal and interest back into circulation, merely to persist in servicing a perpetual multiplication of falsified indebtedness), we are ever unjustly saddled with perpetually increasing falsified sums of debt, increased perpetually by so much as periodic interest on an ever greater sum of falsified debt, until we suffer the present terminal dispossession and failure? These are not just plausible causes, Mr. Norman; they are the questions we must have answered if we are to understand that the purported banking system is a justifiable member of democratic or representative governments and societies, as opposed instead to existing in the most obtuse opposition to the very indispensable, common objects of all the remainder of mankind. Nor can it be our cause now to create such forms of government as we already have, for they were created long ago; and the instruments for achieving actual justice remain available to that indispensable purpose, in which the material we request is incumbent. But it is our obligation therefore to uphold the only tenets which can serve humanity; and so, it is not your right nor your authority to deny us answer, ostensibly based on a potential fact these questions and their answers, or your lack of answer, may indeed comprise some cause. So a further question is (if the question is not rhetorical), whether in persisting in what we can only rightly interpret from your answers so far, is an inevitably terminal system of exploitation… whether this even comprises a willful and criminal usurpation of the very forms of government history has fought to establish; and thus whether indeed, this usurpation itself explains how and whether the incumbent forms of government nonetheless are indeed serving the people. So plainly and explicitly then, this is the scope of our focus. And so, in fact it is for your lack of credible answer, that we believe too that even you anticipate the days of the present obfuscation of our currency are numbered. Therefore indeed, these are simple, straightforward requests for recorded information, each and every question of which in fact can only have one truthful, accountable answer. If the banking system has no recorded account which could justify such a destructive process as we have carefully and openly inquired about then Mr. Norman, just say so, for that itself will cut to the quick — indicating in fact all we really need to know about purported banking. But please do not discredit yourself by offering mere purposed evasion, for that would instead indicate willful persistence in what are obviously monumental crimes against humanity. I can only say in summary Mr. Norman, that if I were a banker, and that if I were interested in providing a veritable justification of banking, if there were such a thing, I would certainly answer these intelligible questions by providing that justification. If on the other hand, even lacking such justifications, yet I were interested in justice, I would confess the truthful and perhaps shameful answers to these questions, that the world finally achieve justice by your blessing. To be entirely and perfectly clear then, no less is at stake than the very possibility of prosperity, as opposed to terminal dispossession. (C) Copyright 2011 (and earlier) by mike montagne. ALL RIGHTS RESERVED. Click HERE & HERE for more information. 20110702 mike montagne 029 foi against the bank of england. 20110709-mike-montagne 030 bank of england on the ropes. Downloads of these broadcasts can be found in: Audio archives . To establish a true sustainable economy by adopting Mathematically Perfected Economy ™. Mathematically perfected economy is a currency not subject to interest, comprising a debt financing all permissible enterprise, paid by each and every debtor exactly as they consume of the associated production. There is no inflation or deflation, as the currency in circulation is always equal to the current value of existent production across however much of the economy is supported by a circulation. Neither the value of money or assets are altered by changing proportions of circulation to indebted assets or services. The value of the money is always consistent in quantity — both in earnability and spendability — with the remaining value of the indebted assets which exist, for which it was issued, and which constitute its immutable value. The remaining circulation is always sufficient to pay off debt. Further production therefore is not impeded by a deficient circulation, deplenished by paying more than what circulation was introduced for to finance the production. Debt is not multiplied beyond the circulation or remaining value of indebted assets. To pay debt obligations exceeding the remaining value of indebted assets sets off a perpetual cycle of re-borrowing and multiplication of debt. Merely to maintain a circulation, we must borrow again so much as we have paid beyond the original circulation which was equal only to the un-multiplied debt. Neither production or consumption are impeded by imposition of extrinsic cost. In every transaction, production is traded for equal production. So long as we make such a circulation available to production, no impediment, limitation, or inequity whatever are imposed upon production or commerce. Production and commerce are fully expedited only by a completely liquid and effectual currency. Mathematically perfected economy is no more than a singular prescription, dissolving unjust intervention.